***Please note: Virgin Bingo is closed. Please visit our top 10 UK bingo sites here. Virgin Bingo is brought to you by the makers of Virgin and has been upgraded to the Gamesys Software. This website has been available since 2005 and it continues to offer great bingo, celebrity gossip, and even regular guests who are quite famous. Although not all choose to use their names, many will quite openly tell you who they are and even take on games with you if you prove a worthy challenge. You also find that the chat rooms of very social and the people want to talk to anyone who has a good conversation going. Super Links: £20,000 in guaranteed cash every day between 8am and 12:30am for 90 ball bingo fans. Prizes are from £250 to £2,000 every half hour. Two for One Bingo: BOGOF every day between 9am and 12am. Available in the 90 ball Enterprise Room. Free Bingo: Available in the Adventure Bingo Room from time to time. Chat masters always keep you up to date. Depositing players only. Search for the Phoenix Free Game: Free spins and cash prizes when you search for the grid on the Secrets of the Phoenix slot. The goal is to find the matching symbols under the mosaic tiles with prizes up to £100. 1st deposit Bonus: Deposit £10 and get 30 free spins on Double Bubble. Maximum bonus is £200. Wagering requirements are 1 x For bingo games, 20 x slots games, 80 x 3D and Classic Roulette, Pai-Gow and Caribbean Stud. Minimum deposit is £10. T & C’s apply. Must be 18+ to play. Reloads: On occasion and or by email for VIP players. Wagering requirements: 1 x For bingo games, 20 x slots games, 80 x 3D and Classic Roulette, Pai-Gow and Caribbean stud. Loyalty scheme: V*Points can be earned for every £5 spent in bingo or £20 on slots or casino. Redeem the points to get cash or Virgin Flying Club Miles. Maximum Withdrawal Depends on the method. £10,000 for most transaction except PayPal and Neteller at £5,500. In all methods, if you need more money, just request multiples transactions. Withdrawal Times: 24 hours to process and then almost instant for Ewallets and then 1-5 working days for Credit/Debit Cards and Bank Transfers. Mobile Games: yes, 90 ball is available on your iPhone and Android phone. Not available for Android Tablet or iPad just yet. Casino Games: Roulette; 3d and Classic, Blackjack; Multihand and Single Deck, Poker; Caribbean Stud and Pai Gow, Instant wins, Slots, Keno, Hi-Lo and Live casino. Slots Games: Double Dubble, Secrets of the Phoenix, Wonderland, Drive; Multiplier Mayhem, Starburst, Koi Princess, Peggle, Cleopatra, Lobstermania 2, OMG Kittens, Deal or No Deal, etc. Facebook: https://twitter.com/virgingames Check out their fan page for all the latest bonuses and promotions. 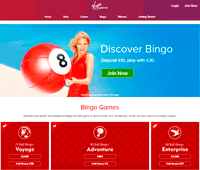 Virgin Bingo has many popular games on the website and it continues to draw many thousands of people from all over the world, especially in the UK. However, there are also many other games offered at Virgin Bingo which you can enjoy including casino, slots, Roulette, Blackjack and more. Many currencies accepted such as £, Euros. Virgin Bingo games have a cash match bonus of 200%, deposit £10 and have £30 to play. Beyond the initial deposit bonus, you can also become a VIP and be a part of their continuous cash bonuses and regular gift giveaways. There is a reward loyalty program, which consists of attaining the popular High Flyer Club rewards.